How To Create Online Exam? Create & share online quizzes, exams, tests or assessments in minutes with images, videos, math equations, or tabular data for Free. Perfect for corporate training, certification, distance education, pre-job screening, or just fun quizzes. 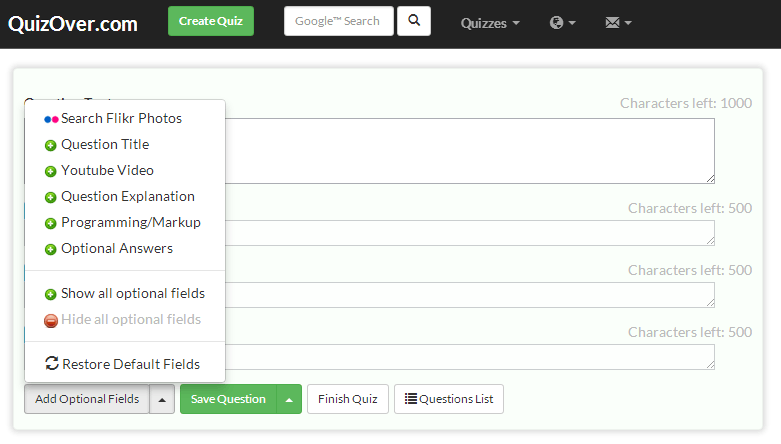 Read our how to create quiz in 3 steps? guide for a quick introduction. Publish your quizzes, tests, exams, or assessments for free and send it to your friends, colleagues, students, trainees, etc.. Your audience can take quizzes as many times as they wish (unless you define a certain limit). Our services are free for the quiz author as well as the quiz taker. Moreover you may charge your audience for taking your quizzes. While entering your questions, show only the entry fields you need and hide all other optional fields. Your choice of shown/hidden optional fields will be saved during the whole session, in other words, when you enter your next question, you will see exactly the optional entry fields you selected. Choose who can take your quizzes. This should be your first choice if you publish open course ware quizzes. You would opt for "Registered" access level when you want to collect leads and track the candidates who took your quizzes. Subscriber (recommended) Upon starting your quiz, the quiz-takers will automatically become subscribers (i.e. follower) to your content channel. 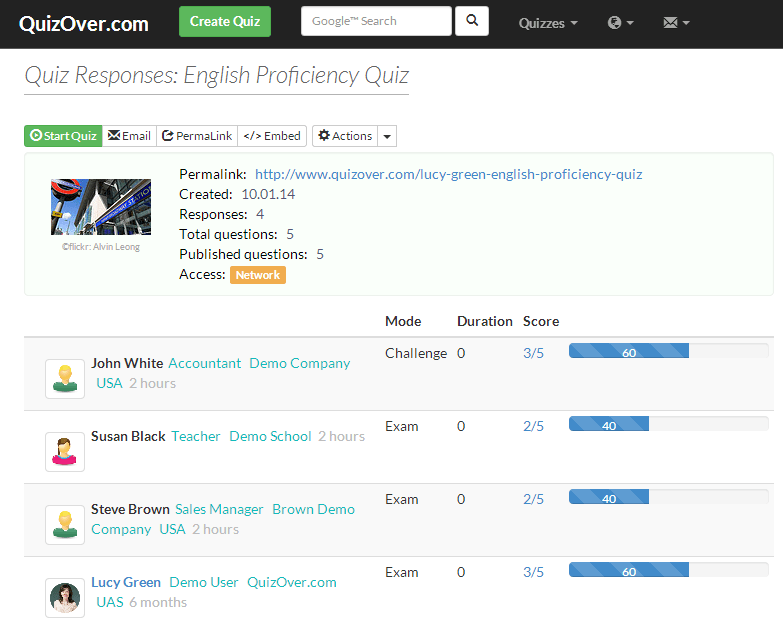 Your channel subscribers will be informed about your updates like new quizzes, questions, comments, etc. You would opt for "Network" access level whenever you want to manually determine who can access your quiz. 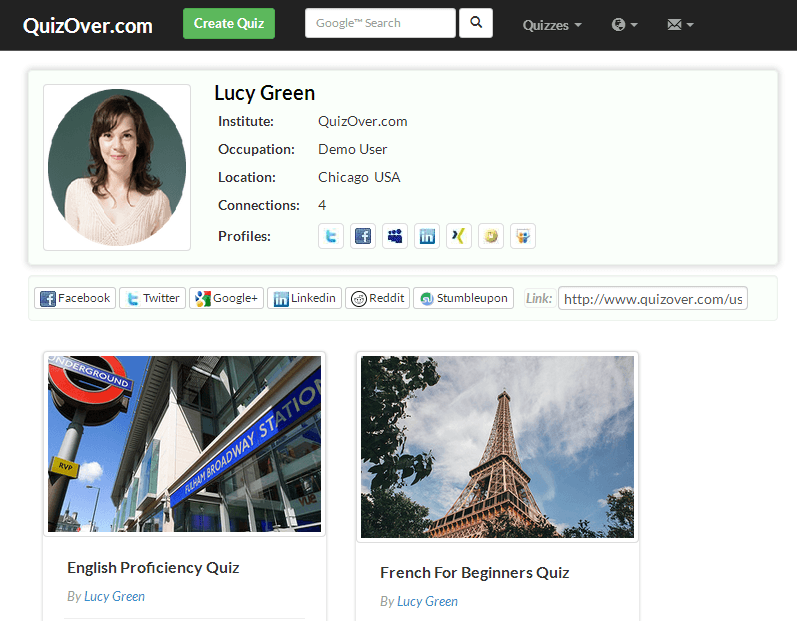 All your network members will be able to access all your quizzes defined as "Network access level". You may send any quiz to your audience, the recipient gets an Email with a direct link to your quiz. You would keep the quiz private as long as it is still in draft phase. 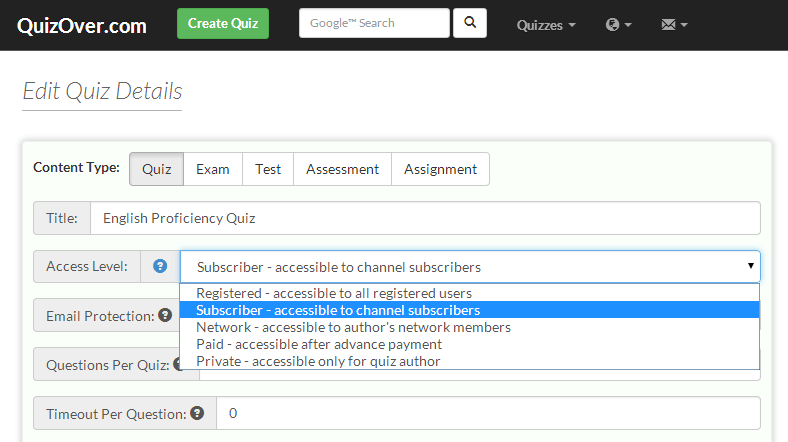 Subscriber Upon starting your quiz, the quiz-takers will automatically become subscribers (i.e. follower) to your content channel. In addition to the 6 Quiz Access Levels you may restrict access to your quizzes through your company email domain name. Simply enter a list of allowed email domains (for instance: @my-company.com , @other-company.org) and then only users registered with a 'verified' email address that contains one of those email domains will be allowed to start that quiz. For each quiz you may define an optional value from (3 to 100) to limit how many questions to render when a user starts that quiz. For example if you've created a quiz with 30 questions and defined "Questions Per Quiz = 10", our system will choose only 10 questions (from those 30 questions pool) each time a user takes your quiz. For each quiz you may limit the number of times for this quiz to be taken by each user within a certain time interval (optional value from 0 to 999 'days'). For example if you define "Response Interval = 30" then each user may take this quiz only once every month (or 30 calendar days). This is the default response mode, the exam taker can move forward or backward through the questions, and may change any answer to previously submitted question as many times as the timeout (if any) allows. Once started the quiz taker has to walk forward through the questions sequentially, and will not be able to amend his/her answer later on. 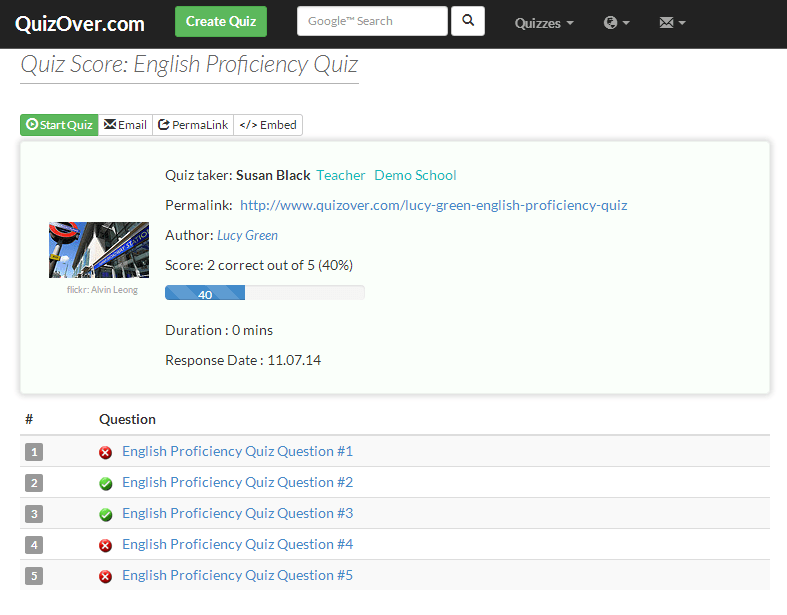 By default only you (the author of the quiz) can create or edit questions in your quizzes. However if you would like to bring your team with you, you may optionally let your team/friends have the administrative rights to edit the questions in one or more of your quizzes. 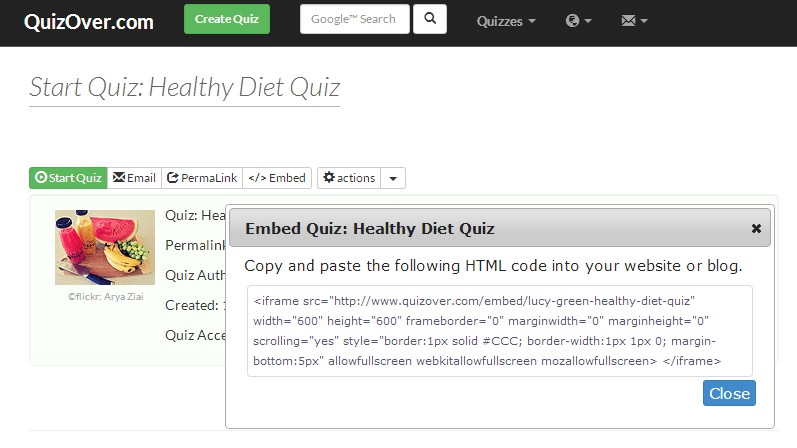 Embedding your quiz in your website or blog, will allow your audience to start that quiz from within your site. This is a great way to boost your site 'Bounce Rate' and 'Time on Site' by getting your audience engaged with your interactive quizzes. For each quiz taker you may review his/her quiz response evaluation sheet, and know exactly which questions the applicant missed. 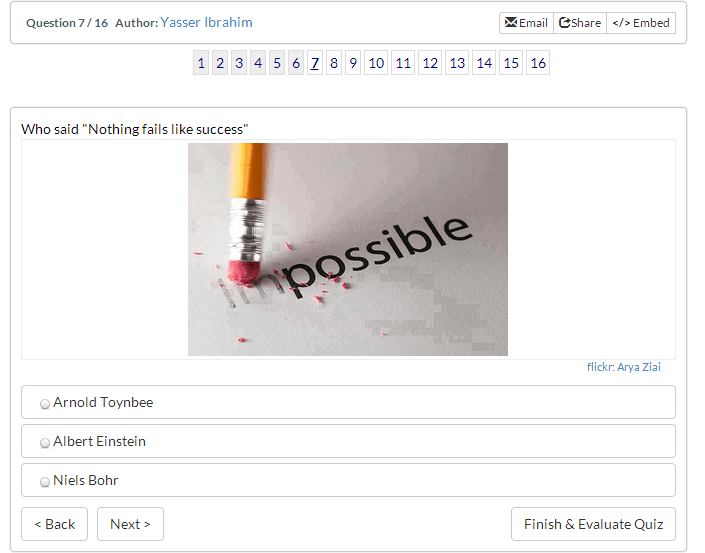 Embed your quiz in your Facebook™ account in just few steps, and let your friends take the quiz from there. 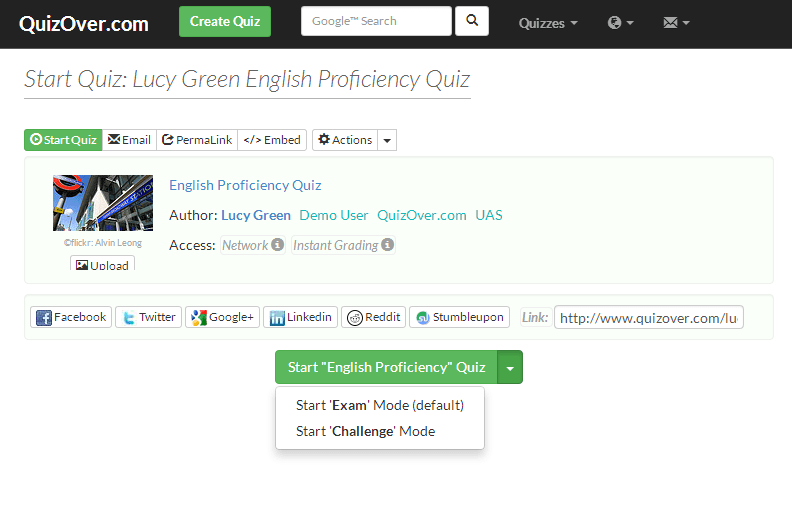 All your published quizzes will be accessible from your public profile page. 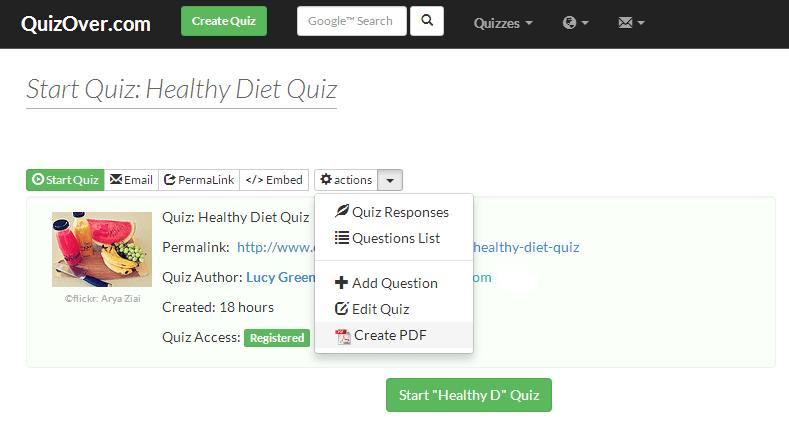 Export your quiz questions to PDF document with one click. Connect with your friends, colleagues, students, trainees and to exchange knowledge.